Raw Food Diets describe a number of diet plans based on eating Raw Foods. Generally these diets are plant-based, and are comprised of at least 75% raw food. Apparently raw foods contain the enzymes that are thought to be removed during the cooking process. 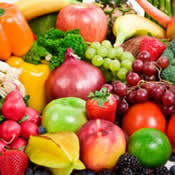 A raw food diet is generally made up fruit, vegetables, nuts, seeds, sprouted seeds and grains, dried fruit and juices, rolled or flaked grains, herbs and spices. The goal is to eat foods closest to their “living state” as possible. Some people add cooked grains and legumes, good quality fish and poultry (although a number “raw food-ers” are strict vegans). Weight loss is almost a certainty on this diet, due to its vast differences to the conventional Western diet. Calorie and carbohydrate intake are reduced leading to weight loss. It is also hard to overeat on a diet due to the high water and fiber content – another reason why weight loss may occur. This diet can be very challenging to follow, particularly from a social and shopping perspective. However cooking time can be reduced! Protein can be low unless appropriate levels of legumes, nuts, and seeds are eaten. Generally a nutritionally good diet, but potentially difficult to sustain. Proponents of the diet claim the raw food diet diet has anti-aging properties. 12 Steps to Raw Foods Helps readers to avoid the pitfalls of adjusting to a raw food diet as well as to maintain this way of eating as a long-term lifestyle. 28 Day Raw Detox A cleansing program that is based on a raw vegan diet in combination with a variety of whole food nutritional supplements. It will appeal to anyone who wants to learn more about the raw food diet or get a kick-start on a healthy lifestyle weight loss program. 300 Raw Food Recipes Raw Food For Everyone is a recipe book containing a bountiful selection of recipes, a primer of raw food preparation methods, and a comprehensive guide to the ingredients that are used in raw food cuisine. 80 10 10 Diet A raw food version of a low fat plant based diet, similar to that popularized by Dr. Dean Ornish and Dr. Doug McDougall. Ani Phyo Raw Food Asia A raw food cookbook offering readers a unique and tasty selection of Asian American Fusion recipes. Eating In the Raw Written by supermodel Carol Alt who says that now in her late forties she claims that she is at the healthiest, slimmest and most energetic that she has ever been due to a raw food diet. If you decide to begin a raw food diet, we recommend following one of the plans mentioned above or take time doing a lot of research on the internet. There are many great recipes available, which mimic many cooked dishes you may be accustomed to. This will help during the difficult transitional period. Also you may want to transition into the raw food diet by starting out 50% raw and 50% cooked. This can make the whole process way less overwhelming and increase your chances for success. I have two friends who have both cancer(kidney and stomach) and diabetes. PLEASE help me and give me ideas on what they can eat. Especially smoothies are hard to make without a sweet fruit. Which fruits should I use? Can someone post some sample vegan meals please? I have severe IBS and need to eat more raw foods. Thanks. I am 5ft, 9 inches tall, about 60 pounds overweight. I started the vegan diet last week, and I am shocked how it curbed my out of control eating binges. The problem that I am having is that my blood sugar drops too low at times. How can I keep my lood sugar level? Two years on Raw Primal Diet is working for me! After years of getting very little help from Western Medicine (Western Medicine did not even openly aknowledge most of my Health problems); I spent 30+ years working with a wide variety of Diet/ Supplement/Natural Medicine approaches for an equally wide variety of Chronic Health Problems that started with a severe resistant Candida Infection at the age of 20. This persisted for 15 years before it was recognised as the cause of my Health Crashing in my early 30’s. Since then, after 20+ years of very concerted efforts and 100’s of Thousands of Dollars – I could no longer justify the expense. Three years ago, I started eating raw Juices in preparation for getting off all supplements. I found Weston A. Price Foundation and a source of Raw Milk which lead me to folks who have found the Primal Diet very helpful. I spent 6 months reading, informing myself and transitioning onto Primal Diet. Continued improvements kept me going. A workshop and consult with Aajonus Vonderplanitz 18 months ago gave me a Prescribed Primal Recovery Diet for my particular Health Problems. Over the past 2 years, maintaining 95% Primal Diet has made 10 X the difference to my health than any of the dozens of Diets/Pharmaceuticals/ Specialists/ Supplements/ Amino Acids/ TCM/ Herbs/ Homeopathics/ Acupuncture/ChiGong/PhysicalTherapy/Chiropractic/ Massage/Orthotics/ Meditation/Spiritual & Energy Work/Flower Essences etc that I have used. I am off 90% of the Supplements – and the severe Chronic Fatigue, Fibromayalgia, Sleep Problems, Joint Problems, Skin,Dehydration (hands/feet) and Pitting Oedema (claves), Hair, Stomach,Bowels, Adrenals, Thyroid, Liver, Gall Bladder, Heart Palpitations etc etc have shown 75% improvement. Yes it does take time and trouble to make the Fresh Raw Food and to take that Lunch Bag out the door with me – but the results are worth it. And we have saved enough $$$ on Supplements that we have been finally able to manage a car loan. One does need help to get the right combination of foods. This is a whole new ball game for most of us -and takes time to adjust till it works. Aajonus has been excellent. Gabrielle Cousins and David Wolfe appear to also help people make astounding recoveries and have incredible knowlege on the healing properties of all things Vegan ( though personally – I experienced the most improvement after introducing raw meat – so find their low blows to the worst forms of meat production unfair to ethically minded omnivors like myself). I have found the Raw Paleo Forum and Raw Paleo Diet Sites very helpful when I have questions on raw nutritional info and recipes. I am new to the raw food diet as prescribed by Natalie Rose in ‘the raw foods detox diet’. *Does anyone know how this would work for a 20 yr old 5’2” 115 lbs girl. Would my body even lose anything? Hello, I am a vegan and just yesterday I decided that I would start transitioning into the raw food diet. I have been vegetarian my whole life, and have never really been overweight but not as healthy as I would like to be. I reckon it will be hard to stick to because cooked food is everywhere! But reading all of these positive comments make me feel like its well worth it. I will definitely try this! I have found that eating a raw vegan diet has helped ease the mental stress of eating disorders because you become more connected with the food you eat and your body’s functions. you also feel better about what you are eating! i am about to start this! wish me luck. also how long will it take to lose 20 pounds on this diet? was wondering if you are allowed to have any alcohol if you eat only raw foods. love my red wine also are baked potatoes ok? I have a friend who went on raw food for 8 months- besides losing a ton of weight (he was very overweight before) I could swear his skin looks 10 yrs younger. I totally want to- but the food although it says reduces cooking time actually takes MUCH longer to prepare. u can spend 3 hrs a day making food- and if it’s going to be organic- can also cost a lot. Out of all the diets I’ve tried, I have had better success on this diet. I have been transitioning to the raw food slowly for the past couple of months and noticed a tremendous difference in energy levels, low blood sugar, lower cholesterol, normal blood pressure, clearer skin, just to name a few. Talk to your doctor, join support groups on and offline, research which plan works for you! What works for you may not work for someone else. I have been following the Blood Type Diet (type O) for 2 months now and feel great but think the Raw Foods Diet may be the missing piece to those pesky last 10 pounds I’ve been trying to shed for 20 years. Any other Blood Type dieters out there with wisdom to share with one going to the Raw Foods Diet? hi i’m 21yrs old and live in ky. i want to try this lifestyle but don’t have much support could some one be my txt buddy or something? my number is 859 652 0297 thanx! As a 50+ aged obese women, who has tried probably 70% of the diets on this list, I find that this “raw food diet” has been the most successful adventure into the dieting world that I have taken. As in all dieting, you must exercise some intelligence and pay attention to your bodies reactions, but once a person gets past the detox stage of any diet, good things should start to happen. And with this diet, good things have finally begun to happen for me. hey im 15 and im doing a project on this but it looks real interesting so im thinking about doing it and im determind to do it and i just wan to know like for how long i have to do this diet and what are some things i need to eat for breakfast lunch and dinner so if anyone can respond that would be great im also gonna work out while doing the diet so how long until i get the body that i want? If you’re considering doing this diet, make sure you have a good blender. To a raw foodist a good blender is like a good oven. At the start of the raw foods diet, I felt nausea and even had mild headaches. I was detoxing. The first few days were a mixture of bliss (from eating raw) and what have I been doing to my body all these years. When I was vegetarian, I went from a size 5/6 to a size 12. I though being a vegetarian was the healthier option, but I got fat in spite of help from nutritionist and doctors. So, a friend asked me to take a raw food challenge. This is the best thing I could have done. My skin got clear, I dropped a dress size and have tons of energy (I don’t need Red Bulls or Starbucks anymore). I have only been on this diet a few weeks and a lot has changed for me. I feel blessed. I would advise anyone to talk to a doctor about detoxification on a raw diet, so you know why and how your body is changing. I would also recommend talking to a nutritious who is familiar with raw foods, vegan and/or paleo diets. I have found books by Natalia Rose helpful, David Wolfe’s website, Muata Ashby’s Kemetic Diet and Detox 101 invaluable resources. Above all listen to your body. When you do the right things for it, it thrives. I just purchased the book and I am trying to get as much information as possible to do everything properly! I will let everyone know my progress good or bad! Thanks for all the input everyone had, it is helpful to see the pros and cons! What’s the simplest way to get introduced to this way of eating? How do I know if I’m getting enough vitamins and minerals and protein? i see sheep’s milk yogurt in lots of organic markets, health food stores, safeway, freddie’s, whole foods,…..
Where on earth would the average American find sheep’s milk yogurt, organic or not??? The raw food diet is wonderful, as the CEO of http://www.rawguru.com I talk with many people that have had success with the raw food lifestyle. People experience weight loss, radiant skin, happiness, and those who suffer from aches or even dis-eases eventually heal and become better than ever. Not sure of the accuracy but WHFoods.com seems to be a good source of info for this kind of diet. You can see the content of different foods and even search for foods by essential nutrients. Seems like a good resource for this. although this diet works wonders, and after struggling with an eating disorder for 6 years, helps shape a healthier lifestyle- YOU HAVE TO BE CAREFUL! there are too many people who don’t realize that although you are ”only” eating raw/live food, you can still get enough calories. any person who wants to diet smartly has to remember that the base physiological need of calorie intake/day is 2,000 calories. and that is at the very least. starving yourself at a 1,200 calorie diet like we’ve all been told is the calorie intake of weight loss (which, it does make you loose weight), is unhealthy. it does not only turn your metabolism into fat-storing mode, but also wreeks with sideaffects. (consuming 1,200 calories or less a day is NOT enough for your body, and your body WILL try to fight back). If long-term weight loss is desired, a long-term living plan is a necessity. So pick a ”diet”, or ”lifestyle”, that will work best for you, and for your life, and remember to stay healthy! Everything you can imagine is in your reach! p.s.-this diet does work wondres. i just adivse anyone looking for solely weight loss to stay away. as we all have heard… ”detox” diets can be dangerous to some is misused and cause dehydration, poor concentration, rapid weight-loss (which your body won’t maintain when you’re done btw), etc…. I need help converting to a raw food diet for health purposes. Can someone help me? Please email me at wendlynn19@yahoo.com. Hi I have oscillated between eating a raw diet and a cooked foods. I found that I developed high blood pressure and gained 14kgs over 18 months when I stopped eating raw foods and went back to cooked foods. I have since gone back to eating a raw diet and feel 100% better. I am in my late forties and look and feel a lot younger (so people tell me). On the raw food diet I have heaps of energy, never get colds,the flu or viruses. I had a skin cancer on my leg that disappeared when I ate totally raw food for a few months, and I need very little sleep when eating live foods, but wake up feeling refreshed. I am a health professional and do recommend that people at least try eating more raw foods in their daily intake for better health. I am a convert and will not eat cooked foods again. There are tons of resources, and though the change can be difficult to make, the benefits of the lifestyle change are AMAZING and you will not regret it. I’d be happy to guide you in the right direction, but am not sure how to contact you, as leaving an email on a public site would not be the wisest idea. Trust me /…IT WORKS!!! u know what i do…when i wanna grab that fried chicken wing…i just go like , u know what God made this apple beautiful and fresh so ill eat it the way he made it, no coocking no friying! Just keep ur faith in God. He wants us to eat, but not to overeat, you know eating proportionally and as healthy as possible. Do it for Him, thats why we give Him thanks b4 we eat,,,=so eat healthy for Him! ps-it doesnt mean i dont eva get tempted…im not perfect either! I am thinking about starting a raw/live foods diet. Just rescently many people in my life have died from cancer, been diagnosed with diabetes, and suffer from heart conditions. Personally, I am experiencing things like horrible digestive problems and gas-passing. I eat horribly! I eat the SAD. I do not exercise well, either. I love reading the many different articles and research papers on the benefits and drawbacks of a raw food and live food diet. I also grew up for a few years as a vegetarian. However, the more I think about this topic, the more obsticles I come up with. I have many many questions and am looking for advice about the practicality of a diet like this. My lifestyle is not at all conducive to a diet like this (and I’m not sure there is anything I could do to change much of that…in the near future. Does anyone have any adivice about where I can go for help? P.S. Mushrooms are fine to eat, and have Iron and lots of other phytochemicals in them that can even help prevent and treat cancer as well as other diseases! Reishi, Shitake, and Maitake are good ones to look for, though it would seem that other mushrooms would have similar effects, being in the same group. To increase the amount of Iron you can have something with Vitamin C in it, like citrus and tomatoes. There are lots of delicious raw recipes out there – including ones that are versions of traditional favorites- you can make bread, smoothies, salads, even desserts! One doesn’t even have to go totally raw (such as if they aren’t able to or love certain cooked foods so they can’t give it up). There are health benefits to even being partially raw- like I mentioned- better health, weight loss, younger looking skin, and so forth. So, sure it’s not everyone, but if you are curious and want to give it a try there are so many resources, just make sure it makes common sense and it’s balanced in nutrients. If you have questions, there are those who have lived this way who will probably be able to help you. Anyhow, after much research, this seems to be one of the healthier diets- IF someone can have enough willpower to stick with it and can design a well-balanced version of this diet. There are lots of good resources out there if you are interested in this type of lifestyle. There are those who are successful at it and can help you- look online for help and answers. There are so many benefits to this way of living that after much thought I am going to do this when I am able to. Organic produce does cost more, and organic is the best type of produce to have, even though fruits and veggies have phytochemicals that can help to detoxify poisons from pesticides and other nasty man-made chemicals added to our food supply! If you want to try it, good luck! If it’s not for you then I hope you can have success as well in your quest for weight loss and better health! thanks for the recommendation, oshinn i think i will try it sometime. If your eating active and living nutrients then your body benefits massively, this truly is a very good diet. hey is it ok to use mushrooms as its a good sorce of iron?? i am a raw foodist after struggling with an eating disorder and depression for years… once my body adjusted to the new diet and started getting rid of toxins, i felt REALLY good. like, really REALLY good. it’s not really a diet, it’s a lifestyle… and the changes your body undergoes are magnificent, if you’re ready for them and in tune with them. i urge anyone who wants to experiment with raw foodism to learn about it thoroughly so you don’t have any vitamin or calorie deficiencies, but to definitely try it if you’re interested.